Truth to tell, falsehood lurks about my soul high and low, and through the day it is all I can do to keep to the straight and narrow of the morning’s original revelation. “It is astonishing,” writes Margaret Fuller, the New England transcendentalist, “what force, purity, and wisdom it requires for a human being to keep clear of falsehoods.” Astonishing indeed, especially when I consider that all of this “force, purity, and wisdom” can really spring from no other place than from the depths of the heart. It was Søren Kierkegaard, ninteenth century philosopher and father of existentialism, who said purity of heart is to will one thing. This statement is in fact the title, thus the leading thought, of one of his seminal works. But who in the world wills only one thing? 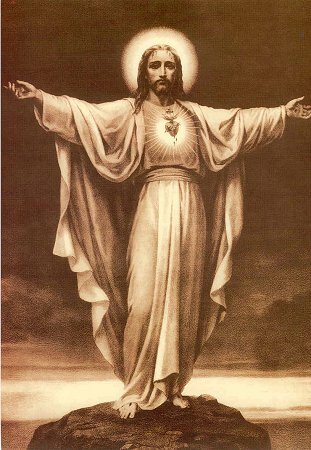 Who therefore can claim purity of heart? Of course claiming this purity would be one thing, actually striving to become the self one truly is, as Kierkegaard puts it, which striving surely must constitute the solid ground for this willing, would be altogether another thing. It was near the time of the Feast of Tabernacles . . . as Joachim was praying I saw an angel appear to him, telling him to journey to the Temple, for his sacrifice would be accepted and his prayers granted. . . . He arrived in Jerusalem on the fourth day of the feast, and stayed in his usual lodgings near the Temple. Anna arrived in Jerusalem also on the fourth day of the feast and stayed with Zechariah’s relations by the fish-market. She did not meet Joachim until the end of the feast. . . . She had been bidden by an angel to meet her husband under the Golden Gate. . . . Joachim went through a little door; the passage sloped downwards. . . . Here he was met by Anna, radiant with joy. They embraced each other with holy joy. . . . They were in a state of ecstasy and enveloped in a cloud of light. I saw this light issuing from a great host of angels. . . . Anna and Joachim . . . were enveloped in a glory of brightness. I understood, that as a result of the grace here given, the conception of Mary was as pure as all conceptions would have been but for the Fall. I had at the same time an indescribable vision. The heavens opened above them, and I saw the joy of the Holy Trinity and of the angels, and their participation in the mysterious blessing bestowed on Mary’s parents. 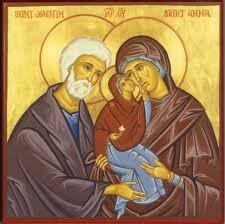 Anna and Joachim returned, praising God, to the exit under the Golden Gate. They came into a kind of chapel under a beautiful and high arch, where many lights were burning. Here they were received by priests who led them away. With respect to birth, it can be . . . either “holy” or “natural”, i.e., it can either be an act of obedience to divine will or rather it can be effected as a consequence of a “call from the earth”. A soul can be sent to the earth or it can be attracted by the earth. In the first case it is an act analogous to the recall of Lazarus. In the latter case it is an event that is half-voluntary and half-involuntary, where the soul falls – often without realizing it – into the sphere of celestial attraction, which bears it to birth, and thereby it is made little by little to forget its experiences above. Birth is then a forgetting of heaven and simultaneously a recall to the earth. 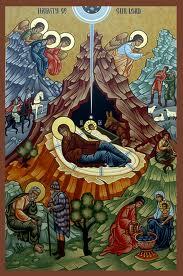 This is not so with “holy birth”. Here it is the remembrance of the divine which is the force which accomplishes incarnation. It is not thanks to forgetting of the divine that the soul is then incarnated, but rather thanks to its remembering. It is in a state of “habitual union” with God that the soul is incarnated. Then its will does not lose memory of the divine. This memory acts in it, imprinted as it is in the soul’s will, during the whole terrestrial life which follows a “holy birth”. One could then speak of a “mission”, or an “election” . . . and rightly, because such a mission is the only one which really exists. For the true mission is not what the human being proposes to do on the earth according to his tastes, his interests and even his ideals, but rather what God wants him to do. Arbitrary “missions”, although due to the best intentions in the world, have only contributed confusion to human history. It is to these inopportune “missions” that we owe many crises upsetting the life of mankind’s living traditions – interrupting, in the guise of passing comets, the peaceful and constructive flow of true progress. A true mission on the earth serves the cause of the ennoblement and spiritualization of that which is, i.e., of what lives as tradition. It brings an impulse effecting the rejuvenation and intensification of tradition. Arbitrary missions, on the contrary, aim at revolutionizing the course of mankind’s history and substituting specific innovations for what lives as tradition. In pushing this to the extreme one could say: a true mission brings to greater perfection everything human on the earth – the family, civilization, culture, religion, etc. whilst arbitrary missions can result in summoning the intervention of Martians or Venusians so that they rule affairs on the earth! Purity of heart is to not lose memory of the divine, it is to remain in habitual union with it. It is to have a true mission. It is to will one thing. “The more one can forget,” writes Søren Kierkegaard, “the greater the number of metamorphoses which one’s life can undergo; the more one can remember, the more divine one’s life becomes.” The more we can forget the nonessential in life, the more open to the essential our life becomes, and the more open to the essential our life becomes, the more we remember our mission. “Life can be pulled by goals just as surely as it can be pushed by drives,” says Victor Frankl. 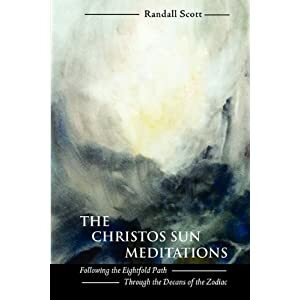 This is manifestly true, but truer still is the more hidden reality that life can be blessed from above through the memory of one’s mission that has been given from above, and through one’s subsequent faithful endeavor to carry it out, so that even what we call the necessities of life become integral to our mission. 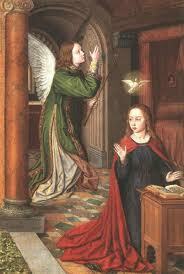 “Be it unto me according to thy word,” said Mary at the Annunciation. Here we stand at the threshold of the mystery of the Immaculate Conception, the mystery actually of any immaculate conception. Some four centuries before the Holy Virgin’s response to the words of the angel, Socrates had said (in effect), “Know thyself.” Mary, the soul itself as it were of knowledge of oneself, goes now an incalculable step further. She says through a few simple words (in effect), to all future generations, Commit thyself. How many ideas become chimeras because we fail to realize them, however partially? Do we fail to realize them because we fail to remember the one Idea that is Wisdom herself, Wisdom being the Idea that is mother of all ideas conceived without blemish, ideas without spot of sin, ideas without the sting of ego, the kind of ideas that we call ideals? All knowledge pursued merely for the enrichment of personal learning and the accumulation of personal treasure leads you away from the path; but all knowledge pursued for growth to ripeness within the process of human ennoblement and cosmic development brings you a step forward. This law must be strictly observed, and no student is genuine until he has adopted it as a guide for his whole life. This truth can be expressed in the following short sentence: Every idea which does not become your ideal slays a force in your soul; every idea which becomes your ideal creates within you life-forces. Purity of heart is to will one thing, the one thing for each of us singly to discover and to live for, as we turn every idea into our ideal, as we return our every ideal to the original conception of our life, the immaculate conception of our unique, divinely-appointed mission on earth, the mission each of us would endeavor to fulfill. 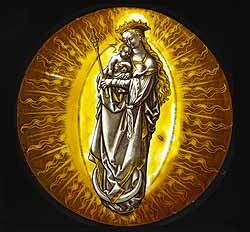 “And a great portent appeared in heaven, a woman clothed with the Sun, with the Moon under her feet, and on her head a crown of twelve stars.” (Rev. 12:1) As it is for the Immaculate Conception of Mary Sophia cosmically, so may it be for each one of us within the soul, our spiritual nature like the Sun shining out into the world, our lower nature – all those falsehoods – like the Moon firmly underfoot.